Almost 4.5 million pets go missing every year, and many of them are never returned to their families. While putting your dog or cat in a collar with your contact information is the safest and quickest form of identification, a microchip is the most reliable, permanent way to ensure that your lost dog or cat is returned home. A microchip is a tiny device (about the same size as a grain of rice) that a veterinarian inserts underneath your pet’s skin, usually between the shoulder blades. 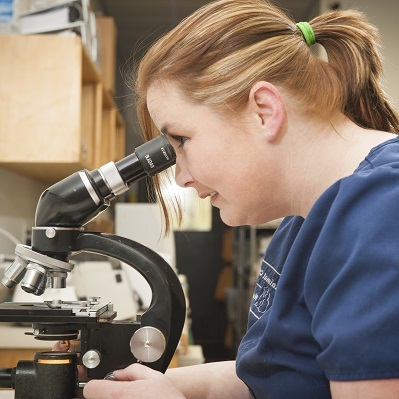 Our veterinarians inserts the chip much like giving an injection, and the process takes only seconds. Neither dogs nor cats need to be sedated to receive the microchip, and the microchips are designed to last for the life of your pet. Once microchipped, your pet has a permanent form of identification. Your personal information is not stored on the chip; rather, it has a unique ID number that can be matched to your contact information on file. Pet care specialists at animal shelters and veterinary offices around the country use special scanners to locate the chip and identify the number. The ID number is then matched to a registry where your information is securely stored. If your dog or cat runs away from your home or goes missing on vacation three states away, you want to be sure that a local animal shelter or vet can identify your pet and notify you immediately. A microchip provides that information, even if a collar is gone or your pet is far from home. Microchipping is a safe, reliable, and humane method to help all pets have the best chance of making it back home. Even if your pet is not the type to run away, circumstances can arise that may separate you from your pets, such as natural disasters, car accidents, or other unexpected events. Microchipping your pets ensures that they can be matched to you and returned no matter what happens. At Animal Clinic of Woodruff, we provide on-site microchip identification and administration services. Unlike many other providers, we’ll complete and send in the paperwork for you, ensuring that your information is promptly stored in the database. Our scanner is a universal reader that detects most microchips developed in this hemisphere, so we can help quickly find the homes of missing pets. Call our office today to make an appointment now to have your pet microchipped, and please feel free to bring in stray dogs or cats that you’ve found so that we can scan them and help find their owners.